Every year seems to get more hectic (that could have something to do with us having more and more kids, but who’s to say). Here’s a few of the things that I’ve enjoyed in the past few months – maybe you will too! This is Nowhere – Written by and for fans of The Airborne Toxic Event, this website explores the music, the band members and the fan experience itself. This isn’t the kind of blog I’d usually read, but the writer is brilliant and good-looking and makes a mean grilled cheese sandwich. Also, he’s my husband. And a very talented writer, so it’s an interesting read for fans and non-fans alike. This year I’m taking a Literary Journalism course. Yes, it is as intimidating and fascinating as it sounds. I’m learning a lot. And reading a lot. Two of my favourites so far… Martha Gellhorn was the first female war correspondant during WWII, sadly overshadowed by her husband Ernest Hemingway, because she is one of the most brilliant writers I’ve ever read. Wiliam Least Heat Moon writes about his travels across America, with such poetry and humour and insight, that I can’t help but reread sentences several times as I go. For lighter fare, I enjoyed Rhoda Janzen’s sequel Mennonite Meets Mr. Right (also sold as “Does This Church Make Me Look Fat?”). Her first book is definitely my favourite, but her humour and delightful descriptions make it easy to enjoy this follow up about her return to faith. Seven Up, Seven Plus Seven, 21 Up… – I’ve become quite enamored with the UP Series documentaries on Netflix. In 1964 a British filmmaker interviewed a group of 7 year-olds from different class and educational backgrounds. There is some repetition between each film, but stick with them. Each one is such an individual and I love to see how their lives unfold. This is my kind of realty show. Marvels Agents of Shield – It’s not life-changing science fiction, but it’s a solid weekly adventure. I can’t explain the dorky appeal of mild mannered, middle aged Agent Phil Coulson, but I’m thrilled to see him alive again. So far, this has the bones of a decent series, especially for Avengers fans. I’ve explained this little trick to so many parents, teachers and babysitters lately. If you are the kind of adult who is willing to hand your technology over to a child, Guided Access is a must. It allows you to open an app for a child on any iDevice, then lock it, so they can play it, but nothing else (no “exploring” your iPhone/Pod/Pad, no deleting apps, no making phone calls/texts, no cranking the volume up…). Here’s how: Go to Settings. Under “General” you’ll find “Accessibility.” Turn “Guided Access” on, then choose your 4 digit passcode. From now on, when you want to start Guided Access, triple click the home button, then press “start.” When you’re finished, triple click again, enter your passcode and “end” Guided Access. Simple and it saves a lot of headaches. Am I doubly geeky for enjoying this? 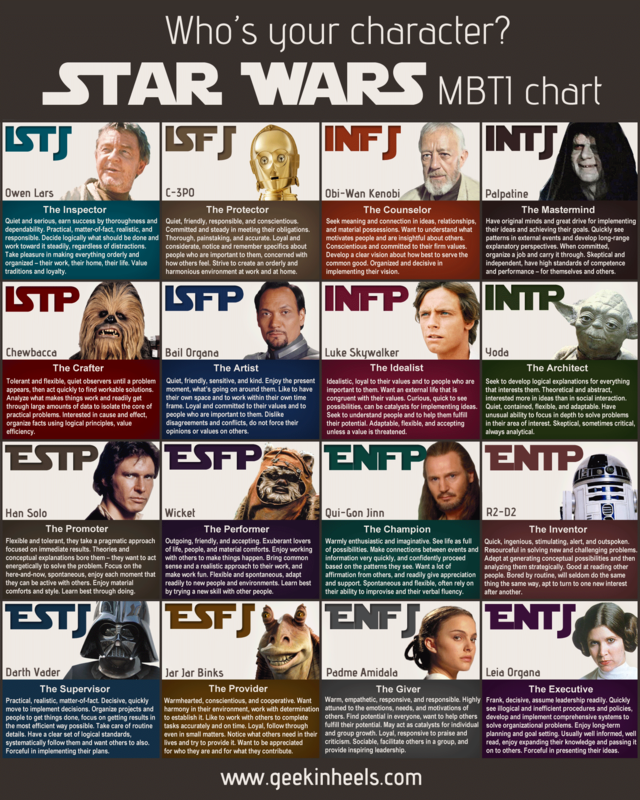 The Star Wars version of Myers-Briggs personality profiles. I happen to be Obi-wan Kenobi. Not Ewan McGregor’s version, but CLASSIC Obi-wan. Living a contemplative life in the desert, wise, gentle, parental, with enough life left in him to lob the occasional one-liner. I’ll take it. If you’ve forgotten the categories are: Introvert/Extrovert, Sensing/Intuiting, Feeling/Thinking and Judgement/Perception. I’ve taken the plunge. 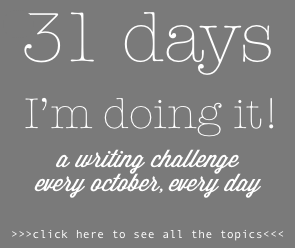 Right before the Oct 31st midnight deadline, I joined NaNoWriMo. No, that’s not another geek thing. It’s “National Novel Writing Month,” and every year about 200,000 writers (well-established to just starting out, kids to seniors, on every topic you can imagine) pledge to write a novel of at least 50,000 words, from beginning to end, during the month of November. It’s about digging into the process and actually finishing something. It’s rough. It’s intense. It’s exciting. Every year several authors polish up their draft and publish an actual novel out of it. This year, I’m trying. That’s it. I don’t even care if it’s complete rubbish, I want to dig in. Also, not sure how I’m going to fit it in, but I think it has something to do with not watching t.v. or surfing the internet (or vacuuming). So here’s me, where blogging might be a little light this month, but that doesn’t mean I’m being lazy. This entry was posted on Friday, November 1st, 2013 at 8:00 am	and tagged with Martha Gellhorn, UP Series, What I'm Into, What I'm Into (Sept/Oct 2013), William Least Heat Moon and posted in favourites. You can follow any responses to this entry through the RSS 2.0 feed. A literary journalism class sounds fascinating! I’ve never heard of that before. I’m really hoping Rhoda Janzen keeps writing. I agree that her first book was her stronger work but I still loved the second one. She consistently made me laugh out loud- and then a few pages later, I’d be wiping away tears. Good luck with NaNoWriMo! Thanks! Yes, the class is fantastic. I rearranged my schedule and dropped another class when I heard of it. SO glad I did. The prof has many years as a journalist, poet and author under his belt, so I’m learning a lot.